Home » What Color Is the Sun, Really? What color is the sun? When you’re a kid, the answer is obvious: yellow. (Or, if you were a contrarian little kindergartner like myself, it was occasionally pink, occasionally orange, and even more occasionally purple). But the sun, we learn later, is yellow only in the vaguest, most arbitrary sense. The light of Earth’s star features, more accurately, a wide range of wavelengths—it’s just that many of those are invisible to the naked eye. You know what can detect them, though? Telescopes. In the video above, created by NASA’s Scientific Visualization Studio and based on data from its Solar Dynamics Observatory, those wavelengths are converted into images that humans can see. 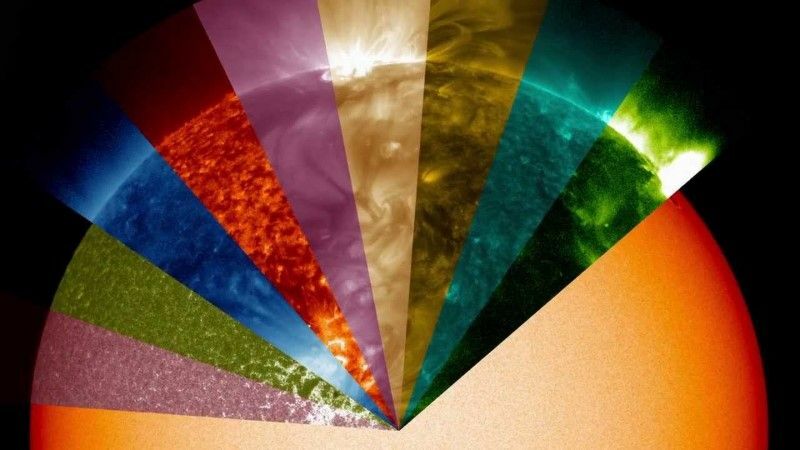 SDO has essentially colorized the sun’s light into a rainbow of different colors. And what’s remarkable is how different each area of the sun can seem as a result of that conversion: It’s not just colors, but textures that change. That’s the case, NASA explains, because each wavelength of light represents solar material at a specific temperature. Which is all to say that our sun, like everything else, contains multitudes. And that little kids who prefer to color the star with more shades than yellow are totally justified in their impulse. By science.